Polly Palumbo became a mom in 2000. Like many new parents, she had lots of questions, the most fundamental of which was this: where can I find good answers to all these questions? She should have been overqualified for the job. She has a PhD and background in psychology, so she had no problem parsing even the most complex studies in academic journals. But grasping complicated information wasn’t her problem – it was avoiding misinformation in parenting magazines and the mass media. Palumbo thought she could help. She pitched some of her own ideas to the top parenting publications, explaining the latest details on mothers’ and children’s health. It took a few more years of frustration with the lack of quality parenting reporting for Palumbo to launch her own blog, called Momma Data. For more than a decade now, she’s explained the research on raising children from an evidence-based point of view, and been critical about outlets and columnists who exaggerate and distort reality. Laura Sanders has a similar story. She’s a writer for Science News, and had her first child in 2013. “When I was out on maternity leave, I started talking to my editor about how hard it was to find good information,” she said. “We’re fighting this ocean of misinformation, but hopefully we can add a drop of goodness with solid science,” Sanders said. She’s not exaggerating. Publications like Momma Data and Growth Curve are still few and far between in the parenting media landscape, which accounts for all the books, magazines, websites, podcasts, etc., specifically targeted at parents, as well as the general interest outlets that occasionally produce parenting-related stories, from your local news station to newspaper op-ed pages. In this environment, for every Polly Palumbo and Laura Sanders, there are dozens of self-proclaimed gurus spouting pseudoscience, hundreds of reporters judged by clicks rather than accuracy, and thousands of bloggers and social media influencers who purely exist to push sponsored products. “The Internet will give you unlimited advice and information. The problem is it’s a messy mix of opinions and parenting philosophy. Much of it is conflicting, and only some of it is accurate,” writes Alice Callahan, yet another mother who created her own blog, Science of Mom, because she was frustrated with the parenting media. How can it be that something as fundamental to human existence as raising children has such a lack of reliable media sources? How is it that there are more sophisticated options for getting information about business, politics and even sports than there are about parenting? How is it that some of the best options available are from a few new parents who decided to take matters into their own hands, as if they’re enthusiasts of an obscure hobby? In other words, why’s it so hard to find good parenting information? If we can answer this core question, it might be a lot easier to get answers to all parents’ other questions. Let’s get one point out of the way: for new parents, there’s no escaping the parenting media. Sure, parents have traditionally relied on family members to pass down their knowledge, but they also didn’t have a choice. There simply weren’t countless other resources at their fingertips. Of course, this has been the case for decades now, so there’s ample analysis available on how effective the media is at serving parents’ needs. In 1998, the University of Wisconsin-Madison held a symposium on “The Media and Parenthood.” A. Rae Simpson, then administrator of the Family Resource Center at MIT, announced the key findings from a two-year research project with the Harvard School of Health Communication to examine the role of mass media in parenting education. “A number of drawbacks seriously undermine the ability of the media to contribute effectively to the well-being of parents and families,” she said at the event. That was the same year Google was founded, and years before most people ever heard the term “blog.” Surely, the search for parenting information is easier today, right? Not quite. It may be less scarce, but it’s certainly just as scattered, conflicting and confusing, if not more so. 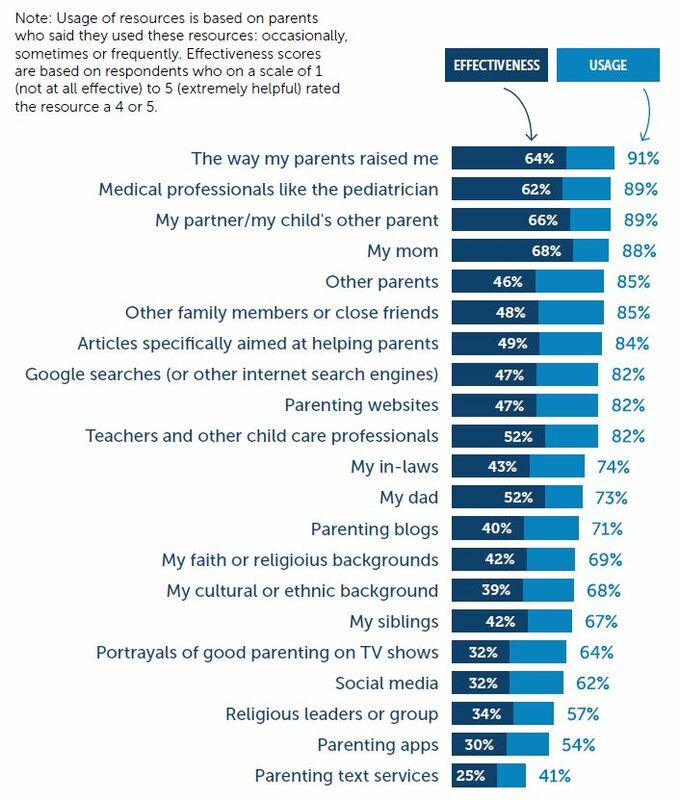 A 2016 survey by non-profit Zero To Three and the Bezos Family Foundation found that while more than 80 percent of parents use websites and search engines to get parenting information, less than half find them helpful. That’s a good point, because the Pew Research Center also recently found that while 75 percent of parents use social media, 65 percent of social-media-using parents said they hardly or never come across useful parenting information there. At the same time, Pew didn’t ask how often parents find bad information through social media. After all, we live in a “fake news” era, and this includes hoaxes targeted at parents. This doesn’t just mean that parents see a lot of junk when they’re scrolling through Facebook or browsing the web. Other research shows that parents encounter lots of questionable answers even when they are actively seeking serious information. In 2015, researchers surveyed parents taking their children to a Toronto pediatric hospital, and in a paper titled, “Are Parents Getting it Right?” they explained that 98 percent of parents searched for information online before going to the hospital, but less than a quarter regarded what they found as safe, accurate and reliable. “An unprecedented majority of parents and guardians are using the Internet for their child’s health information. Of concern is that parents and guardians are currently not using reliable and safe sources of information,” the researchers summarized. That’s a massive problem, and it may only be getting worse. Even if 98 percent of parents already search for information online, Google’s data shows new parents are doing so more frequently, and they’re doing it in a way that suggests they want to find quicker answers, not spend substantial time vetting their sources. Furthermore, the Google data shows that it’s not only when parents are taking their kid to the hospital that they’re searching for serious information. So, parents are most interested in getting quick, clear, credible information to important questions. That seems easy enough for the media to provide, right? There’s a long list of reasons that journalists consistently screw up complex subjects like health, science and human behavior. The real goal for most news organizations is getting attention, not aiding understanding, so it’s really to be expected that they take the most sensational angles and don’t deliver what’s truly in their audience’s best interests. On top of these generic journalistic problems, navigating parenting information poses specific challenges. For one, new parents are essentially encountering a whole new media landscape. With general interest news, most people have sources they have come to trust (rightly or wrongly) over the course of their adult lives. When they become parents, suddenly they have to immediately figure out which sources are reliable and which aren’t. Is Parents.com better than Parenting.com? Babble, or Bundoo? Motherly, or Motherwell? If parents aren’t savvy or interested enough to look at multiple sources, they’re likely to just take whatever comes up in the first few search results. That’s not ideal, because search engine algorithms simply surface what’s most popular, not what’s most informative. One study published in the journal Neuro-Oncology found no correlation between the order of search result rankings and the quality of information those results offered, as rated by medical professionals. Many other studies have shown that online parenting resources are rife with incomplete, inaccurate or deliberately deceptive information, making those search results a minefield of falsehoods. In our experience, the top results are often from random parenting message boards, which are practically vectors of inaccuracies. If parents are willing to go above and beyond to curate only the most reliable sources, they’ll quickly find that there aren’t that many. Sure, there’s certainly a proliferation of books, magazines and websites on the subject. But so much of it is for entertainment, not education. The biggest parenting magazines, websites and social media platforms are filled with fluffy listicles, celebrity news and ad-stuffed slideshows, while thousands of parenting blogs out there are primarily dedicated to product placements. In fact, it’s safe to assume that much of the parenting media was primarily created to sell ads, not to inform parents. Is it true that this is simply what parents want? It sure as hell doesn’t look like it. After all, that’s mostly what’s available, and yet most parents are unhappy with what they’re finding. It seems like people have a mistaken idea of what parenting information should look like. But why? She’s trying to say publishers and broadcasters dumb down parenting content because they think women are simple. It sounds like a hot take, but it’s actually pretty clear that the media indulges in lazy caricatures of their audience. Just look at how it treats fathers. This attitude is so taken for granted that the large majority of parenting sources are primarily focused on mothers. Just look at the most visited parenting websites. At the time we’re writing this, it starts with CafeMom.com, and goes on to include ScaryMommy.com, Mothering.com, WorkingMother.com, KellyMom.com, MotherAndBaby.co.uk, JustMommies.com, ModernMom.com and MomsWhoThink.com. You have to look outside the top 20 to find a father-focused site, with AllProDad.com at No. 21. That partly makes it a self-fulfilling prophecy that fathers don’t consume parenting content. The fact that they’re practically ignored has convinced generations of dads that there’s nothing for them in the parenting media. For instance, when Mike Rothman sought investors to start his own dad-focused site, he said most of the men he spoke with couldn’t imagine reading parenting information. His site, Fatherly, now has millions of dollars in investor funding and annual revenue to go along with millions of followers and subscribers. There’s no better indication that the parenting media isn’t the result of pure supply and demand, but inaccurate profiling of parents. There’s other evidence that people are increasingly rethinking these stereotypes. Last year, The New York Times changed the name of its parenting blog from Motherlode to Well Family, recognizing that the name itself effectively excluded half of parents. “Over the years, Motherlode has challenged the notion that parenting is a women’s issue […] and it has also become clear that the name Motherlode is more than a little at odds with the larger conversation, which includes mothers, fathers, step parents, grandparents, children, siblings, friends, pets and every possible variation on family,” editor KJ Dell’Antonia said in announcing the change. Even Palumbo notes that the media’s improved so much in this regard since she had her first child 17 years ago. It clearly still has many issues, but as long as these new brands bring with them content that doesn’t rest on inaccurate stereotypes, and actually solves parents’ problems, it should represent progress. That said, even if the parenting media weren’t such a mess, there are still some intractable issues keeping parents from getting easy answers to all their questions. The truth is, there simply aren’t always straight answers to a lot of seemingly basic questions about raising children, for a few key reasons. First, there’s a genuine lack of science on pregnancy and child development. It’s pretty obvious why, though: no one wants to run tests on pregnant women or children. Second, the “right” answer is often dictated by culture. Different parents in different locations, of different races, of different religions, etc., may have different goals in mind, which will change what they consider to be the ideal answer. Her examples of discipline and self-esteem bring up a third issue. So many of the questions parents ask are more about the art of parenting, not the science of parenting. Questions like, “How do I raise an honest kid?” and “How should I talk to my children about religion?” make great magazine columns and conversation on parenting message boards, but it’s unlikely there will ever be universally satisfactory answers. Maybe parents are simply expecting too much if they want straightforward solutions to those types of situations. For that reason, we should really divide parenting information into two categories: questions of art, and questions of science. Knowing how much sleep a child needs to be healthy is a matter of science, while getting your kids to go to sleep at their bedtime is a matter of art. But even then, science can greatly inform the art. As Po Bronson and Ashley Merryman demonstrate in their excellent book “NurtureShock,” much of what parents call instinct is really just “a hodgepodge of wishful thinking, moralistic biases, contagious fads, personal history, and old (disproven) psychology.” Meanwhile, neuroscience and careful analysis of large groups of kids can give parents genuine facts about the way children develop, therefore improving and reducing the amount of philosophy parents need to develop on their own. All these complexities don’t let the parenting media off the hook. Rather, they increase the need for a trustworthy parenting media. Parenting is genuinely a complex, difficult process, which is why we need more careful, clear, credible information, and less focus on celebrities, listicles and general sensationalism. While we’re holding our breath for that happen, there are some immediate solutions parents can take to find better parenting information. Before we launched Parentifact, we spent months looking for credible sources of parenting information. It was time well spent, because we tracked down people like Polly Palumbo, Laura Sanders, Alice Callahan and Gwen Dewar, all of whom have proven to be tremendously helpful sources for us. However, we both have journalism backgrounds, so we have an interest and awareness that both motivated us and helped us get through the online obstacle course. It’s unrealistic to expect many other parents would have the enthusiasm or ability to do all that digging. So, we not only compiled all the best parenting sources we found, but we also created a custom Google search engine that only searches those reliable websites. How did we decide on which sources to include? We first started with medical institutions and organizations. The internet makes it possible to get info straight from these trusted sources, rather than having to rely on media intermediaries. Hospitals like Mayo Clinic and Cleveland Clinic have robust resources online, while sites like HealthyChildren.org, which is run by the American Academy of Pediatrics, and Safe Kids Worldwide, run by Children’s National Health System, are tremendous resources targeted directly at answering important parenting questions. We then added those blogs and publications we’ve found to consistently publish evidence-based information. This includes many of those blogs we’ve mentioned earlier, like Momma Data and Growth Curve. It excludes a few sites that do have some solid information but also have inconsistent quality, mixing genuinely helpful content with articles we found to be distracting or misleading. Our list is surely incomplete, and we’re always keeping our eyes out for new sources to add. As we’ve tried to make the case, it’s more challenging than you might think. But it’s getting better. There are more and more good sources out there. While they’re still disconnected and not easy to find, this should bring them together and direct more people to the right places. We recommend reading some of the sources we linked to throughout this article. We could only include a fraction of detail from each of them, so you can definitely learn a lot more about this topic by visiting those links as well. Momma Data, Polly Palumbo’s site. Growth Curve, Laura Sanders’ blog on Science News. Science of Mom, Alice Callahan’s site. “Parenthood, information and support on the internet. A literature review of research on parents and professionals online,” by Lars Plantin of Malmö University, and Kristian Daneback of Gothenburg University, published in the peer-reviewed journal BMC Family Practice. “The Role of the Mass Media in Parenting Education,” by A. Rae Simpson of the Massachusetts Institute of Technology, delivered at University of Wisconsin-Madison symposium in 1998. “2016 National Parent Survey Overview and Key Insights,” from Zero To Three. “Did You Fall for This ‘Fake News’ Bogus Baby Wipe Recall?” from PJ Media. “Are Parents Getting it Right? A Survey of Parents’ Internet Use for Children’s Health Care Information.” a study from The Hospital for Sick Children in Toronto, published in the Interactive Journal of Medical Research. 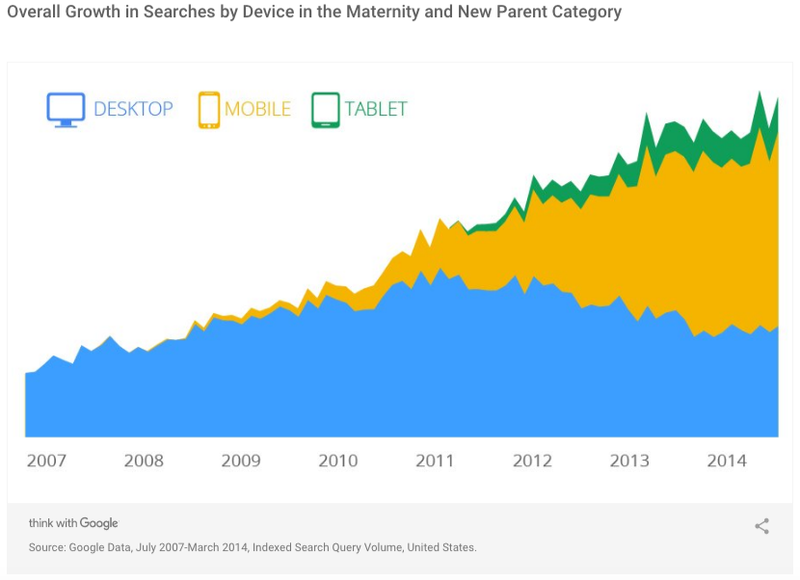 “Diapers to Diplomas: What’s on the Minds of New Parents,” a 2014 report from Google about parents’ search habits. This report is mainly intended for marketers targeting parents. We didn’t even touch on the role that marketing and advertising play in affecting parents’ knowledge, but it almost certainly doesn’t help. “Stop blaming the internet for killing newspapers. Start blaming editors.” from one of our cofounder’s (Lee’s) personal site. This post breaks down many issues with the content the traditional media produces, in far more depth than we could do so here. “Quality of health information on the Internet in pediatric neuro-oncology,” by researchers at Royal Marsden Hospital and the Hospital for Sick Children, published in Neuro-Oncology, the journal of the Society for Neuro-Oncology. “Mommy Blogs” and the Vaccination Exemption Narrative: Results From A Machine-Learning Approach for Story Aggregation on Parenting Social Media Sites,” from multiple researchers at Los Angeles health systems, published in JMIR Public Health and Surveillance, a journal that focuses on public health and technology. “Best and worst parenting websites of 2015,” from CuteMonster.com. It doesn’t look like they’ve done more up-to-date lists like this, but we wish they did, because the ones they did were useful for us. “Mommy Blogger Josi Denise Explains Why She Quit; Says Blog ‘Consumed’ Her Life,” from ABC News. We originally linked to the actual post this story references, but it looks like now that Denise took down her old site. The original post went into great depth about how companies simply pay mothers to post about their products, often in deceptive ways. “Google’s Richard Gingras encourages innovation in media outlets to fit technological environment,” from talk at the Harvard Kennedy School’s Shorenstein Center on Media, Politics and Public Policy. This is a long and probably dry talk if you’re not interested in media history, but he discusses how so many sections in newspapers were created simply to sell ads, from automotive to gardening. That system absolutely applies to parenting as well. “Parenting Inc.” by Pamela Paul, an excellent book on all the products and marketing parents are bombarded with. “Parenting Books: Do parents deserve thought-provoking books?” from Momma Data. “This Father’s Day, an Online Battle to Correct the Media About Dads,” by Josh Levs in MediaShift.org. Alexa’s list of the most visited parenting websites. Note that these numbers are estimates made by their own system, not definitive rankings. “Fatherly wants to build “the leading digital site for parents” — and is counting on mothers to get it there,” from Nieman Lab. “Well Family: A New Name and New Home for Motherlode,” from The New York Times, announcing their parenting blog’s name change. “Baby sleep requirements: How much do sleep do they really need?” from Parenting Science.